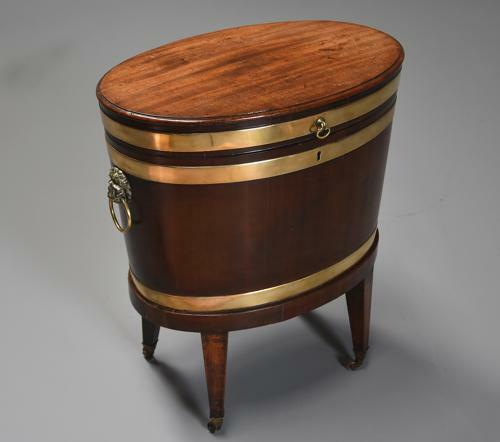 This cellaret consists of a fine, faded mahogany top with moulded edge leading down to a brass band supporting the freize. The body of the cellaret is of oval and tapered slender form having a fine patina with brass band to both the top and bottom with brass lion mask and ring brass handles to either side, all supported by four tapered legs with brass castors. This piece is ideal storage for bottles or would also make a great occasional table, it is in excellent condition for age, is of stable construction and can go straight into a home.